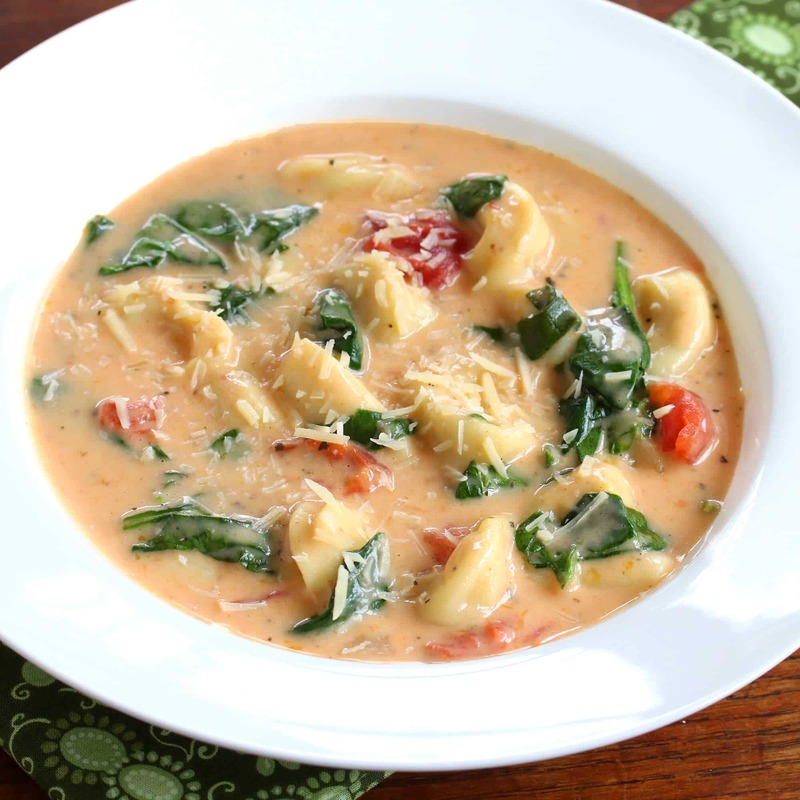 This wonderfully creamy and flavor-packed tortellini soup is super easy to make and is sure to become a family favorite! 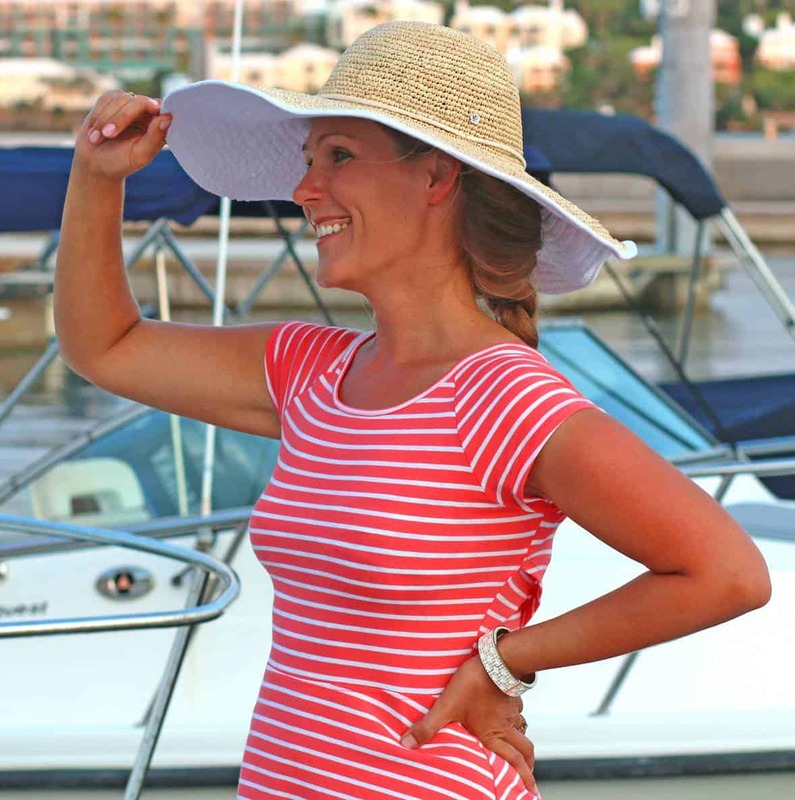 It’s been a crazy week and I’m ready for the weekend, how about you? I’ve been nursing a case of strep throat with accompanying fever while still having to meet the day to day demands of taking my kids to their various activities and meeting deadlines of my own. Fortunately the fever subsided just in time for my husband and I to use the tickets we had already purchased to catch the final performance of Broadway’s traveling production of The King and I in Seattle. I felt like it was a well deserved treat for having to put up with strep! Isn’t strep just awful? But I’ll take the high fever portion of it any day over swollen tonsils and the excruciatingly painful throat that feels like with every swallow you’re having your throat sand-papered, blow-torched and scratched with a hundred sharp, rusty nails, all at the same time- gah, it was awful! So what does all this have to do with soup? Well, this week the only thing I could handle swallowing were liquids and then, gradually, liquids with soft substances like pasta. 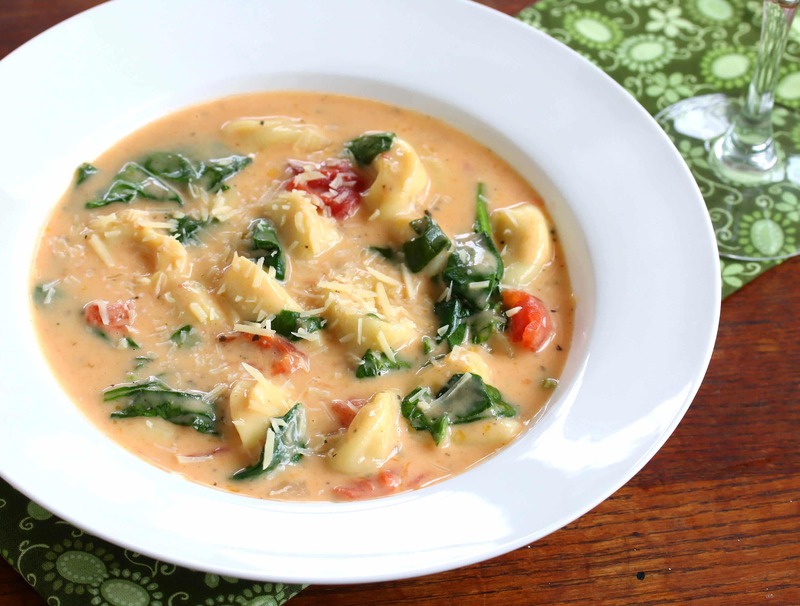 This Creamy Tortellini Soup was perfect not only because of its soft and creamy texture, but because it was easy and fuss-free dish to make when I wasn’t feeling up to cooking. And that’s the beauty of slow-cooker recipes. Unlike many creamy slow-cooker soups though, this one doesn’t have that all-too-common unsightly curdled appearance or texture. That’s because we’re waiting to add the cream and cheese until the very end, resulting in a silky-creamy soup that’s visually appealing and absolutely delicious. Fuss-free, easy to make and featuring wholesome ingredients, this is sure to become a family favorite! Add the broth to the slow cooker and whisk in the flour until dissolved. Add the spices, onion, garlic, tomatoes, tomato paste and stir until incorporated. Cook on LOW for 4-5 hours or on HIGH for 2-3 hours. Add the frozen cheese tortellini and cook on HIGH for another 15-20 minutes or until the tortellini are done. Add the shredded Cheddar cheese, spinach, cream, cream cheese and and stir until the cheese is melted, then continue to cook for another 5 minutes or until the spinach is wilted. Add salt and pepper to taste. 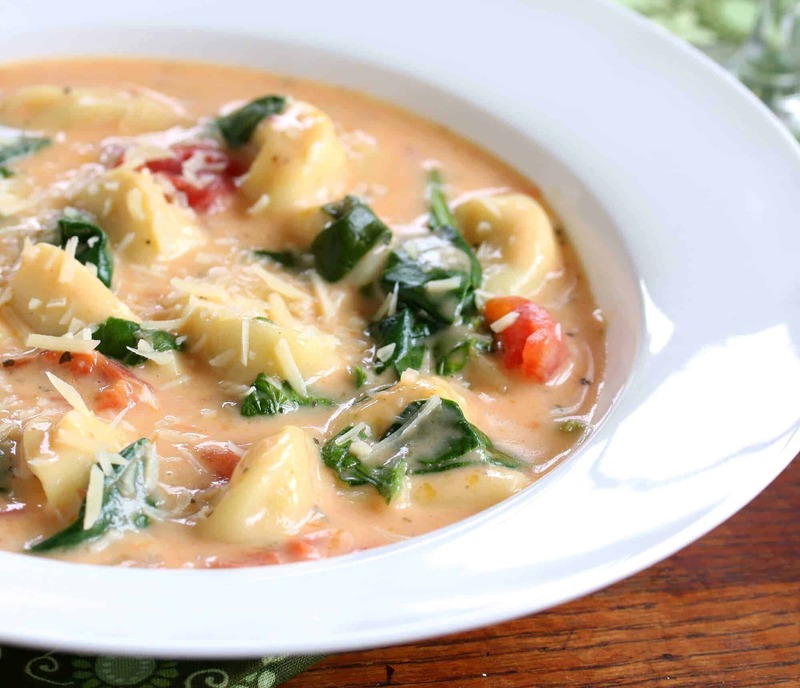 Your slow cooker tortellini soup is ready! Serve sprinkled with some freshly grated Parmesan cheese. 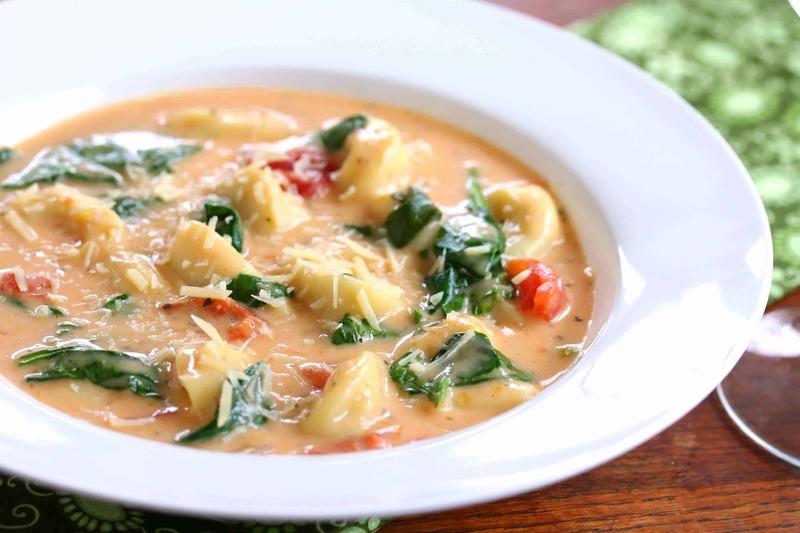 This soup is so easy and fuss-free to make the results are positively delicious! Add the broth to the slow cooker and whisk in the flour until dissolved. Add the spices, onion, garlic, tomatoes, tomato paste and stir until incorporated. Cook on LOW for 4-5 hours or on HIGH for 2-3 hours. Add the frozen cheese tortellini and cook on HIGH for another 15-20 minutes or until the tortellini are done. Add the shredded Cheddar cheese, spinach, cream, cream cheese and and stir until the cheese is melted, then continue to cook for another 5 minutes or until the spinach is wilted. Add salt and pepper to taste. Love this creamy soup! I don’t use my slow cooker often enough and I’m always looking for more delicious inspiration. Great blend of spices here! So sorry you’ve been sick — no fun! This looks fabulous, and so smart to add the cream/cheese at the end! Ugh, strep is the worst. I hope everyone is well again soon. This soup would be the perfect comfort meal when you feel under the weather. 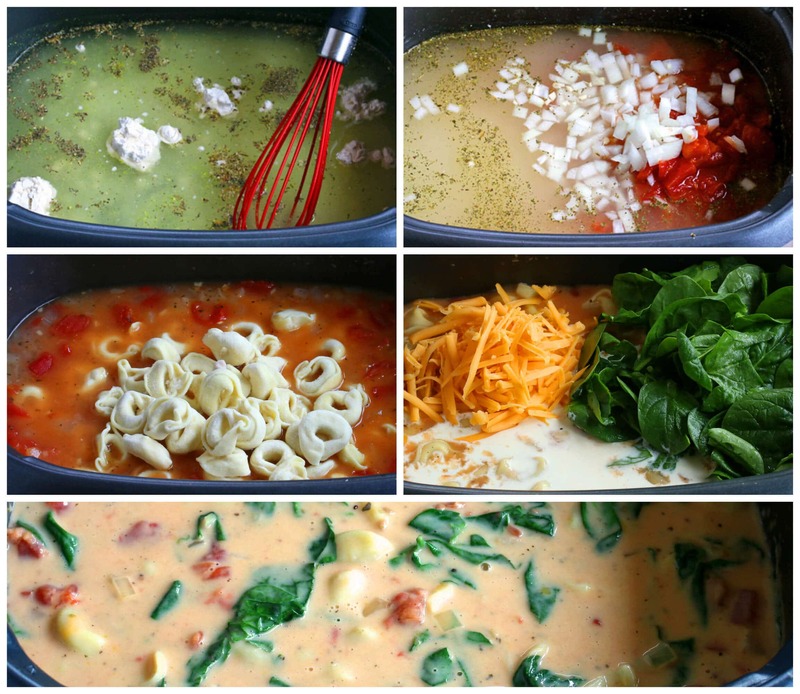 I haven’t had tortellini soup in forever – looks so good! Ugh. Strep is the worst! I actually grew up having it all the time until we realized my dad was the carrier but had no symptoms! This soup sounds like the perfect sick comfort food. Feel better! This soup looks incredible!! So creamy and full of amazing flavors!! This looks delicious! I am drooling over this! 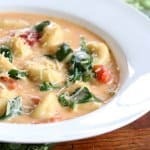 My kiddos love tortellini soups! This looks so creamy and delicious! Tortellini soup is amazing! Pure comfort food! Sorry you weren’t feeling good. Hope you’re doing better now. This soup sounds delicious. I love soup in the winter and can’t wait to try it. Fantastic, Joan, thanks so much! ooo this soup looks perfectly creamy! I’ve always been a fan of creamy soups! Love this! Awesome, Kimmi!! The Italian sausage is a great addition. Thanks for the feedback! I made this for a church potluck.It was AMAZING…the first soup gone! This recipe will become a staple in our house! I added Italian chicken sausage as well, and as it sat in my slow cooker in transit to church it thickened up a bit. It was almost “stew-like”. So good! That’s wonderful, Pam, I’m so happy to hear that, thank you! So you drain the can of tomatoes? Hi Stroets, no, don’t drain them, just add the whole can with the liquid. I’ve got extra chicken broth and there was a sale on tortellini! Fate brought me to this post! Looks amazing. Hi, can I double the recipe? This was so easy to make a BIG hit with the whole family, thank you!